What Are Graded Pokémon Cards? Should I get my cards graded. What Are Graded Pokémon Cards? Should You Get Your Pokemon Cards Graded? A graded Pokémon Card is a card that has been sent to a Professional Grading Company and graded for condition. The Grading Company has a team of Professional Graders whose sole purpose in life is to grade Sports Cards and other Collectible Cards. The Cards are graded on a scale from 1 to 10. Half point grades are possible. For example, a 1.5 would be fair. After the cards have been graded by the Professional Grading Company; the cards are given unique certification identification numbers; entered into a database; and carefully sealed in custom tamper-evident holders. Many people call these encapsulations “slabs”. So, Why Have Pokémon Cards Graded? First: Graded Cards can sell for a lot more than ungraded cards! If you want to buy a mint, First Edition Charizard on eBay, you have two choices. You can either buy an ungraded card, and trust the seller when he says the card is mint. Or you can buy a graded, sealed card and know the card is truly mint. Some buyers will take a chance on ungraded cards, while others will pay more to get exactly what they want. 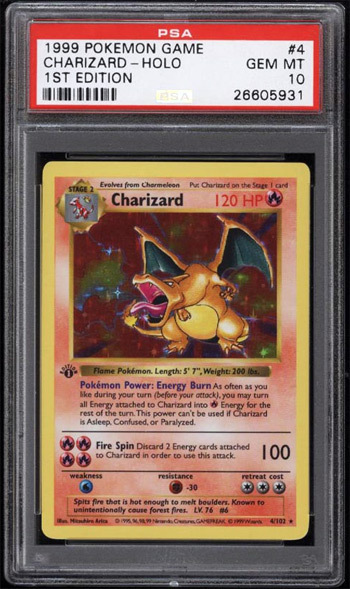 This PSA Graded Gem Mint “10” First-Edition, Base Set Charizard pictured here sold for $16,270 on eBay in March 2017. Another sold for over $13,000 in February 2017. Graded cards always sell for more than ungraded cards! The best price we could find on an ungraded First-Edition, Base Set Charizard sold on eBay in the first quarter of 2017 was $1900. Dozens of graded cards sold for higher. Second: The Encapsulation itself is actually very nice and it protects the card very well. There are several ways to protect your cards at home, but none are foolproof. Encapsulation is one of the better ways to protect your most valuable cards. What are the Card Grading Services? The two big players out there are PSA (Professional Sports Authenticator) and BGS (Beckett Grading Service). There are a lot of articles on the Internet comparing these companies. The choice is ultimately yours. 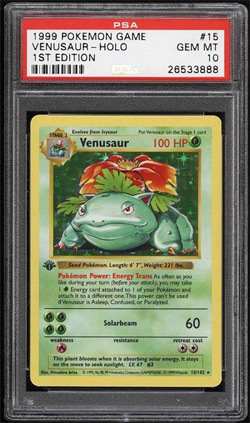 For whatever reason, Pokémon Collectors seem to prefer PSA over BGS, and you’ll see more PSA graded cards on eBay. PSA seems to give you a better boost in sales price. 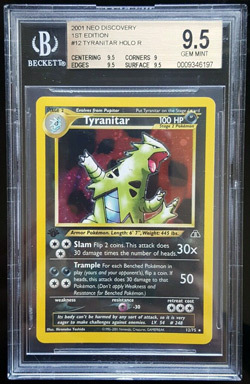 How Much Does It Cost to have a Pokémon Card Graded? You’ll see prices ranging from $5 to $15 to get a single Pokémon Card Graded. But you have to pay for shipping & insurance both ways, so it leans more towards $10 per card. Prices do go down if you send cards in bulk though. And if you plan to get a lot of cards graded there are reduced rates and monthly specials for members. If you send in about 30 cards at once, and catch a monthly special, you will probably spend about $10 per card. There's also a catch. You have to declare the value of the cards for insurance and authentication. If you have a 1st Edition Charizard that you think is worth $2500, the grading on that one card might cost you $95! This is listed on PSA's fees page. Should You Get Your Pokémon Cards Graded? This is a tough question to answer. Usually it does not make sense to have a card graded unless it is very old and really valuable and in Near Mint Condition or better. Newer cards might fit in here too if they're extremely rare or "chase" cards. A chase card is usually a bonus insert that might is not part of the set. We would say if a card it a very collectable card, and worth over $100 you might want to consider getting it graded. And we would only send cards out if you think they will receive a score of 8, 9 or a 10. If it's super rare and valuable, a 7 would be a good score too! Check the Completed Sales section on eBay and find the prices that cards have actually sold for, not what they are listed at. First-Edition, Base Set Holographic Pokémon Cards sell at great prices. As do “chase” cards from many of the sets. One Last Thing! Prepare to be disappointed! It is really difficult to have cards graded 9 or 10. Especially on older cards. Cards need to be centered perfectly. The have to be cut perfectly. They can't have dings to the corners, or edges, or the surface. There can be no roughness on the face or edges. Most older cards you might think are perfect seem to come back as 7's or 8's. 10's basically have to be protected from the get-go ... taken directly from a booster and highly protected immediately. Most people weren't doing that 20 years ago. I've sent in about 30 cards myself and maybe got two to three cards rated 10. And these were all cards that went right from boosters to binders (or hard plastic encapsulation top loaders). You have to understand that 7's and 8's and 9's are still really good scores - Near Mint or better! Whether its comic books, coins or Pokemon Cards though ... they higher the score, the better the price.